LAS VEGAS – Las Vegas has long been at the forefront of the travel industry, leading the charge into new and innovative spaces. As tourism and technology evolves, the destination has continued to find ways to incorporate new innovations to enhance the consumer experience. With chatbots, robots, advancements in shopping, and more Las Vegas has become the hub of modern-day travel. Vdara Hotel & Spa added Fetch and Jett, autonomous indoor robots, to their hospitality team to assist with an array of requests, as well as food and beverage delivery to guests. Both use advanced technology to seamlessly navigate around people and objects and even operate elevators. The robots can simultaneously prioritize multiple requests while communicating wirelessly with the hotel’s communication system. Upon receiving a request, a hotel employee will load items into the robot’s compartment before inputting the guest’s room number and hitting the “GO” button. Its secure, tamper-proof lid prevents items from being removed until the robot reaches its destination. Fetch and Jett will call a guest’s room when they arrive and once the door opens their lids will automatically unlock for guests to retrieve requested items. Deliveries from the bots typically take less than five minutes to complete. Caesars Entertainment launched Ivy, a 24-hour virtual concierge service for more than 14,300 rooms within Caesars Entertainment Las Vegas resorts. Ivy can provide a seamless hospitality experience through immediate responses where the bot is able to make dining, entertainment and spa reservations, as well as facilitating housekeeping and maintenance requests via text messaging. The Cosmopolitan of Las Vegas’ Rose uses real-time text messaging capabilities to answer 80 percent of guest inquiries. Using her alluring and sassy personality to guide guests through property art tours, amenity deliveries, restaurant and cocktail recommendations, Rose is also fun and likes to play games. Since the launch, the chatbot has gone further with her Artificial Intelligence and Natural Language Processing-based platform to answer questions faster than ever and can now assist with guest checkout. With a remodel of the resort’s 3,033 guest rooms completed, The Cosmopolitan has also updated its in-room technology with tablets available in each room, which allow guests to book restaurant and spa reservations, purchase show tickets, order room service, schedule wake up calls, adjust temperature and lighting as well as provide thousands of e-newspapers and magazines. ARIA Resort & Casino and Vdara Hotel & Spa teamed up with Crave Interactive to redefine the guest experience with modern-day convenience. The software company installed more than 4,000 interactive digital tablets at ARIA, which is the world’s largest installation to date. These tablets serve as a digital control center for each room, offering an array of guest services including in-suite dining, spa services, show tickets and access to the latest hotel information and activities. Following the launch at ARIA, Vdara also had tablets installed in all the resort’s 1,495 luxurious suites. Allied Esports, the world’s leading network of esports venues, and HyperX Esports Arena opened a new dedicated esports venue at Luxor Hotel and Casino. The 30,000-square-foot venue features a multi-level arena complete with a competition stage, LED video wall, telescopic seating, gaming stations, customized food and beverage offerings and a state-of-the-art streaming and television-quality production studio. The arena provides a ready-to-go championship destination for tournaments, leagues and high-stakes match-ups in a setting designed to deliver an unparalleled fan experience. The organization’s flagship location, Topgolf Las Vegas is a 105,000-square-foot golfing and sports haven situated on the Strip. The four-level entertainment venue features interactive golf games using RFID technology to help track the ball’s accuracy and distance for players to receive points. Recently, Topgolf and TCL debuted the first-ever TCL Esports Lounge, which introduces esports entertainment to Topgolf. Along with traditional sports viewing areas the Esports Lounge features best-in-quality TCL 4K UHD 6-Series TVs, ideal for individual and group esports gaming and entertainment. Las Vegas is home to the world’s first land-based robotic bar – The Tipsy Robot, located in the Miracle Mile Shops at Planet Hollywood Resort & Casino. The bot features two cocktail shaking robotic arms serving up drinks and dance moves on the Las Vegas Strip. The space allows guests to interact with the robots while sipping signature cocktails as well as custom options. Customers can also watch the bot stir, strain, muddle and pour drinks in a highly social and digital environment. Shopping in the destination has become easier with the touch of a button at the Miracle Mile Shops at Planet Hollywood. The shopping center introduced Jules, an artificial intelligence conversation interface developed by Miracle Mile Shops and Satisfi Labs. Jules’ witty and spirited personality converses with guests through Facebook Messenger. The chatbot is available 24/7 to answer inquiries that arise while shopping on an array of topics including stores, restaurants, shows, where to shop for a certain item, food and beverage options and information on upcoming events or shows. As she is location-based, Jules can provide specific feedback to users’ inquiries based on where they are within the shopping center. Las Vegas North Premium Outlet has launched DropIt for a more convenient and handsfree shopping experience. 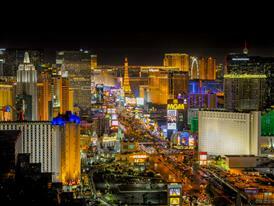 The digital service provides same-day and next-day delivery to partnering Las Vegas resorts. Customers with DropIt can make purchases throughout the retail center, then “drop” their bags at participating retailers and have bags delivered directly to their hotel. The new service is also available for local residences within a 20-mile radius of the center. Vegas VR is a virtual reality app that features only-in-Vegas experiences where users only need the app, a smartphone and cardboard viewer to be transported to the destination. The app features 12 original 360-degree interactive videos that become virtual reality experiences when used with a VR Viewer compatible with smartphones, such as Google Cardboard. Users can place themselves into some of the most iconic Las Vegas experiences including ziplining above Fremont Street Experience, being serenaded on an authentic gondola ride down The Grand Canal Shoppes at The Venetian Las Vegas, driving through Red Rock Canyon National Conservation Area and more.